Triglycerides are a type of fat. They are the most common type of fat in your body. They come from foods, especially butter, oils, and other fats you eat. Triglycerides also come from extra calories. These are the calories that you eat, but your body does not need right away. Your body changes these extra calories into triglycerides, and stores them in fat cells. When your body needs energy, it releases the triglycerides. Your VLDL cholesterol particles carry the triglycerides to your tissues. Having a high level of triglycerides can raise your risk of heart diseases, such as coronary artery disease. 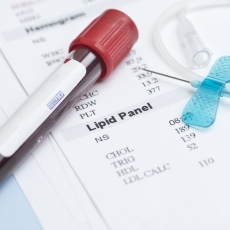 How are high triglycerides diagnosed? Levels above 150mg/dl may raise your risk for heart disease. A triglyceride level of 150 mg/dL or higher is also a risk factor for metabolic syndrome. What are the treatments for high triglycerides? Some people will also need to take cholesterol medicines to lower their triglycerides. Article: Latest Updates on Lipid Management.